Summer vacation is the perfect time to take a family road trip and reconnect with your kids. In fact, this year, my family is planning to head up to Canada to visit Quebec. A lot of preparation has to go into gearing up for a ride like that. You need to plan your route, ensure your car is ready for such an adventure, and stock up on all of your road trip essentials. In fact, this is the biggest road trip the Sweeney clan has ever faced to date. So, everyone is super excited to help out. It’s all hands on deck. Every child is making lists, packing their favorite movie DVDs and ensuring that their stuffed animals are ready to hit the road. But I know that there is a little bit more to do than that. When it comes to travel accessories and road trip must-haves, an easy place to visit is Amazon. Whether I’m hunting for beach gear for my teen or new sunnies for me, I know I can just click and go! No questions asked and any time of the day. 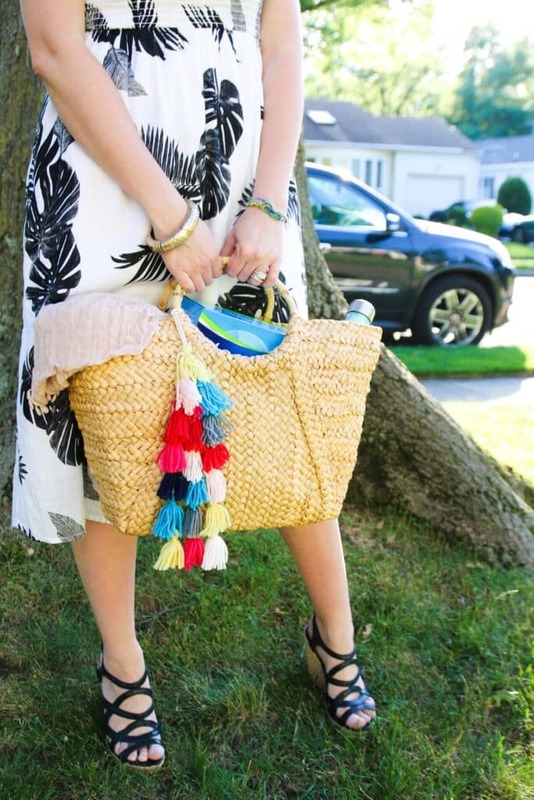 Whether it’s bathing suits or tampons, my beach bag will always remain well-stocked… no matter where I am. And if you follow my YouTube channel, you know that I am a girl who loves a good bargain. There’s nothing that I love more than to find a fantastic deal. Well, guess what? 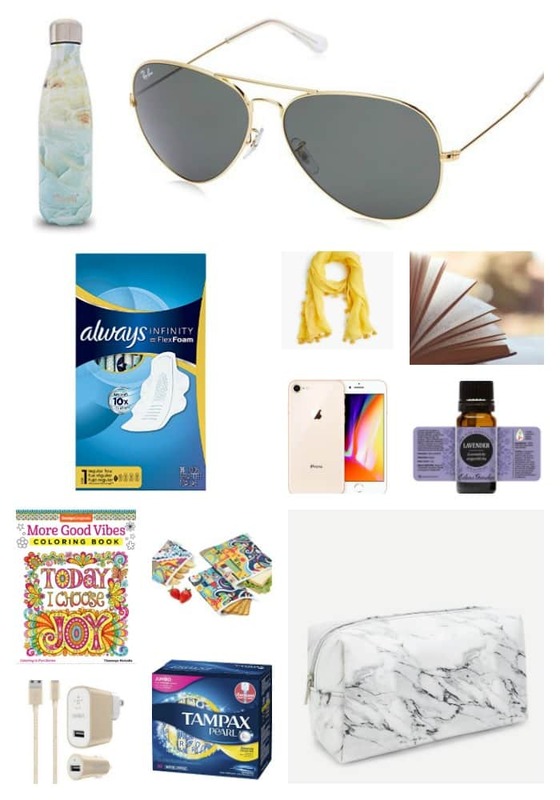 Always Infinity and Tampax Pearl have partnered with Amazon to give everyone an added incentive to stock up just in time for the busy summer road-trip season –a $4.50 coupon on your favorite and trusted products. The discount is automatically applied to your purchase which means that there is no coupon clipping needed. YAHOO! Sunglasses: I am someone who absolutely needs sunglasses when I am on the road. If I get hit with too much sunlight, I am bound to get a migraine. It isn’t always about a fashion statement. Sometimes it is just about protecting my eyes. Sunglasses are a must for long days outside. Scarf: The battle of the air conditioner. 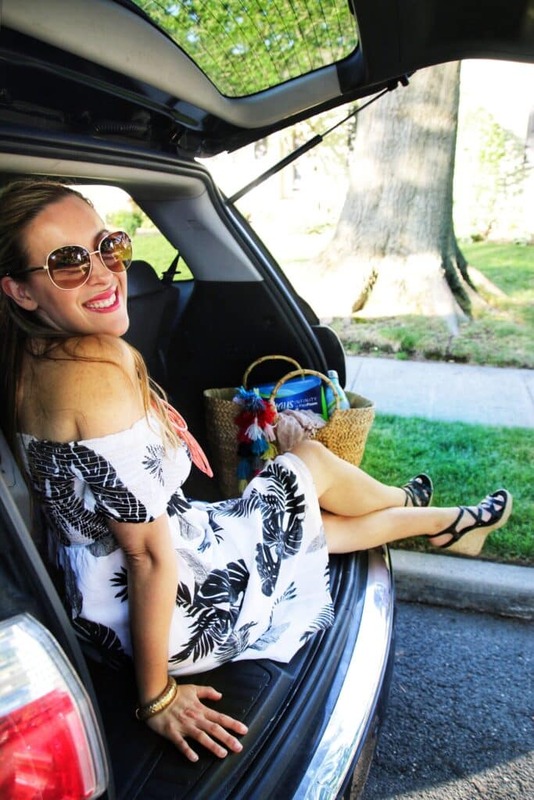 Yes, my husband and I often disagree about the temperature of the car and so that means I typically have to bring extra items of clothes to help warm myself up. Makeup bag: I never leave home without my travel makeup bag. It has all my beauty essentials inside. Water bottle: You have to stay hydrated! I always love to bring my own colorful water bottle with me so that it’s easy for me to refill as needed. iPhone: I mean… who goes anywhere without their phone these days? AMMIIIRRRRRIGHTT? Always Infinity and Tampax Pearl: My daughter and I never leave home without a stash of our favorite feminine hygiene products. Because we are not synched up (just yet), one of us is always in need of something it seems. And besides, it’s always nice to keep a few extra pads in your bag in case someone on the road needs some help. My goodness… that was such a “mom” thing to say, wasn’t it? I’m such a MOMMMMM! Snack Bag: I have three kids. Do I need to say anything other than that? We need to feed them snacks when they get unruly. That’s what we do to calm them. Charger(s): I don’t just have one charge. I have multiple charges. All the chargers. As many chargers as you can think of. Everyone has an iPad. Everyone has a phone. The phones have phones. We must stay occupied!! It’s a long trip to Canada!! Activity Bag: When the kids reach the end of the Internet, I never fret. That’s when “old-fashioned summer” comes out to play. I have a great little kid filled with playing cards, coloring books, Play-Doh, and friendship bracelet string. Current Read: Everyone also brings along a book to read. I have no say with what they pick. It’s completely up to them. Essential Oils: The essentials are actually for everyone. You won’t believe it, but my children actually love the little pick me ups we hand out at mile marker 200. Orange, Eucalyptus, Lavender… oh my! I’ve been using Always Infinity since the day it hit the market. I pretty much mean that. There isn’t another pad on the market that absorbs like it does. You truly walk around forgetting that you are wearing a pad and that is a very good thing – especially for long road trips. We all know how uncomfortable a 10-hour ride can be. The last thing I need is to be worrying about a bulky pad. Well, with Always Infinity, I never have to worry about bulkiness or coverage because that puppy absorbs 10x its weight and is available in 5 sizes. BOOM! For tampon fans, Tampax Pearl has a LeakGuard™ Braid that helps stop leaks before they happen by channeling them back into the core. So, there is something for every traveler and for every situation. 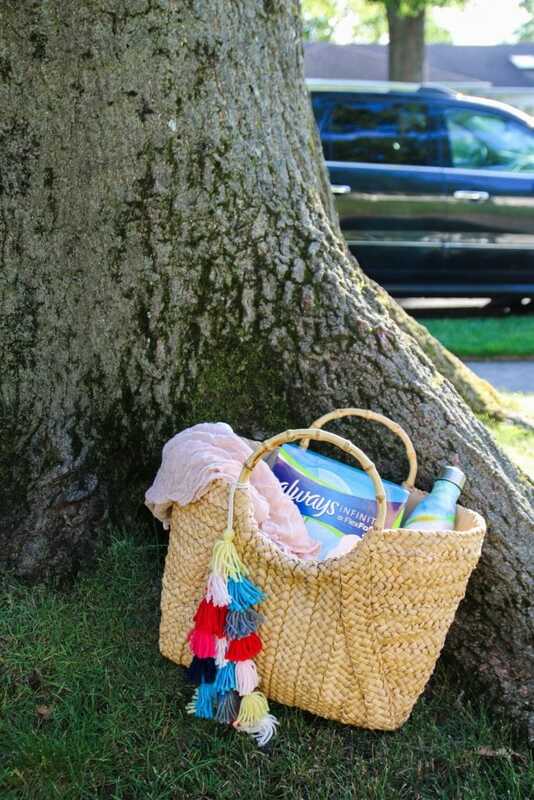 Whether you are hitting the beach or hitting that really cool dive diner that you see up ahead on the road – Always and Tampax have you covered. Go to Amazon to purchase your Always Infinity and Tampax Pearl multipacks! Don’t forget – Amazon is offering a $4.50 coupon (which is applied directly at checkout making it super easy to purchase at the push of a button). In paid partnership with Always Infinity and Tampax Pearl. That’s an amazing deal! Off to add to my cart! Hey thanks for the list! Don’t forget the right instruments to get you where your going! You can have a dash full of devices or upgrade to a multi function touch screen radio. Go to http://www.touchscreenradiopros.com Thanks again for the great post and great advice!